The reverse box failed! The plan then was to replace it with a straight through prop, but when I got to the box it turned out the locknut holding the rear output flange had just come off. It had damaged the seal in the process so I had to rpelace that, but once done she was as good as new again. Was I sorry to see her go? You bet, more than any car I've ever had. Felt really sad as Ian took her through the gears driving her away. Surprising how far away I could still hear it! 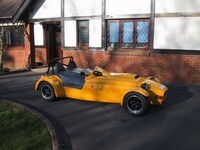 A Megablade is a Westfield 2 seater sportscar powered by a Honda CBR900RR Fireblade motorcycle engine. 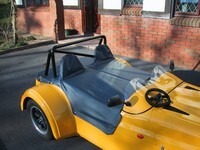 Westfield produce kits styled after the Lotus 7 originally designed by Colin Chapman. 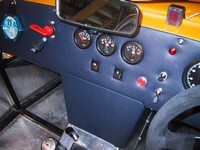 The finished article should weigh in at less than 500kg with about 130bhp pushing it along. And an 11,000 rpm redline means it should sound pretty good too. I considered a few options. I've always fancied building a kitcar. Caterhams are great but a bit overpriced and I simply couldn't justify the cost for a 'toy' car. The Wesfield was the next step down, and had the advantage of offering a full kit, meaning no grubbing round scrapyards or fabricating bits. I could have saved money by going the Locost route, but didn't want that much of a challenge! Which engine to use was the next decision. As an ex-biker it was a bit of a no brainer. So I decided on the Westfield Megablade and started looking for an engine. My brother Andy knew a breaker from a few years ago and within a week or so a '92 Fireblade engine had my name on it.